Prof. Leung Chun Ming is the Vice President (Technology & Development) at the Open University of Hong Kong (OUHK). Prior to joining the OUHK in 1998, he was a physics professor at the Rensselaer Polytechnic Institute in the US for 20 years. He received his PhD in Astronomy from the University of California at Berkeley. His professional interest is in computational astrophysics and technology-enhanced education. In 1995-97, he pioneered in Hong Kong studio teaching and synchronous distance learning using Internet and ISDN technology, and promoted Web-based instruction. At the OUHK he is responsible for the planning and development of physical facilities and technology infrastructure in teaching, administration and student support services. He oversees the operation of three units: Information Technology, Educational Technology and Publishing, and the Library. More recently, he directed the Centre for Innovation project (2007-2011). Its main objective was to develop a next-generation, student-centred, teaching and learning environment characterized by flexibility, connectivity, interactivity, personalization, and intelligence. Currently he is overseeing a project to develop an open textbook system for primary, secondary and tertiary education in Hong Kong. The Web has transformed the way people work, play, learn and do business. Its fundamental values -- openness, freedom, transparency, participation, collaboration, collectivity, flexibility and meritocracy -- have challenged many tradition-bound principles and practices in education. With social and participatory media and tools enabling open and collaborative practices, a democratization of learning and education is emerging that embodies these core values. Examples include the emergence of OERs and MOOCs; and the blurring of boundaries in teaching/learning/research and in formal/informal modes of learning, communication, and publication. Likewise, the convergence of three phenomena -- proliferation of social networks, availability of large-scale data sets, and advancement of complexity sciences -- is creating new opportunities for research in education, e.g. applying theories of complex systems to data-driven studies of collective phenomena of learning in a connected environment. Compared with hierarchical systems, complex systems are large networks of components characterized as being open, self-organized, nonlinear, dynamic, and emergent. Many natural and man-made systems, activities and phenomena can be described as complex systems and modelled as scale-free networks with power-law* properties, e.g. the Internet, power grids, cities, insect colonies, immune systems, and scientific collaboration. The search for universal scaling laws that govern human behavioural dynamics in learning communities is a grand quest of educational research that seeks to gain insight into learning in the connected age. This presentation delineates some emerging trends and issues in educational practices in an open and connected environment, and highlights areas in which complexity sciences are applied to studies of collective phenomena of learning in the networked ecosystem. f(x) ∝ x-γ, where γ is a positive constant. Professor David Wiley teaches in the McKay School of Education at Brigham Young University and is a Shuttleworth Fellow, working to lower the cost and improve the quality of education. He is currently leading Lumen Learning, an organization dedicated to supporting and improving the adoption of open educational resources by middle schools, high schools, community and state colleges, and universities. As an academic, Professor Wiley has received much recognition for his work, including an NSF CAREER grant and appointments as a Peery Social Entrepreneurship Research Fellow in the BYU Marriott School of Business, Senior Fellow for Strategy with the Saylor Foundation, and Nonresident Fellow in the Center for Internet and Society at Stanford Law School. As a social entrepreneur, Professor Wiley has founded or co-founded numerous entities including Lumen Learning, Degreed, and the Open High School of Utah. In 2009, Fast Company named Professor Wiley one of the 100 Most Creative People in Business. 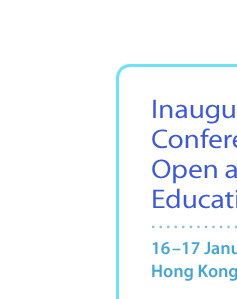 This talk provides a brief introduction to the concept and promise of open educational resources (OER), and moves directly into specific examples of using OER to decrease costs and improve the quality of education: the Utah Open Textbook Project, the Kaleidoscope Open Course Initiative, and the Textbook Zero model of 100% OER-based degree programmes. Research findings and implications for future directions will be presented. Andrew Ng is a Co-founder of Coursera, and a Computer Science faculty member at Stanford. In 2011, he led the development of Stanford University’s main MOOC (Massive Open Online Courses) platform, and also taught an online Machine Learning class that was offered to over 100,000 students, leading to the founding of Coursera. Ng’s goal is to give everyone in the world access to a high-quality education, for free. Today, Coursera partners with top universities to offer high-quality, free online courses. With 80 partners, nearly 400 courses, and more than 3.6 million students, Coursera is currently the largest MOOC platform in the world. Outside online education, Ng’s research work is in machine learning; he is also the Director of the Stanford Artificial Intelligence Lab. In 2011, Stanford University offered three online courses, which anyone in the world could enrol in and take for free. Together, these three courses had enrolments of around 350,000 students, making this one of the largest experiments in online education ever performed. Since the beginning of 2012, we have transitioned this effort into a new venture, Coursera, a social entrepreneurship company whose mission is to make high-quality education accessible to everyone by allowing the best universities to offer courses to everyone around the world, for free. Coursera classes provide a real course experience to students, including video content, interactive exercises with meaningful feedback, using both auto-grading and peer-grading, and a rich peer-to-peer interaction around the course materials. Currently, Coursera has 80 universities and other partners, and over 3.6 million students enrolled in its nearly 400 courses. These courses span a range of topics including computer science, business, medicine, science, humanities, social sciences, and more. In this talk, I will report on this far-reaching experiment in education, and why we believe this model can provide both an improved classroom experience for our on-campus students, via a flipped classroom model, as well as a meaningful learning experience for the millions of students around the world who would otherwise never have access to education of this quality. Professor Bob Fox has over 30 years experience in teaching and research in Australia, Southeast Asia and Great Britain. He is a Professor and the Deputy Director of the Learning and Teaching Unit at the University of New South Wales (UNSW). His research interests focus on teacher professional development; technological practice and change in higher education; blended and mobile learning; e-leadership; innovative physical and virtual learning environments. He is a recipient of the University of Hong Kong (HKU) University Teaching Fellowship (UTF) for excellence in teaching. The UTF is awarded on average to four academic staff per year. He was an Associate Professor and the Deputy Director of the Centre for Information Technology in Education of the Faculty of Education at HKU for twelve years, serving in the last three years as Assistant Dean (Learning Environments) of the Faculty of Education. He has been involved extensively in international academic and professional communities. This includes sitting on international, regional and local editorial boards and on the programme and organizing committees of over twenty international conferences, and on thirty occasions giving keynotes or invited presentations or taking part in consultancies concerning technology in education. He holds a concurrent appointment as Honorary Professor in the Faculty of Education at HKU. There are compelling economic and social reasons to raise the quality of open and flexible learning. International evidence identifies links between levels of educational attainment and opportunities for employment. At the same time, higher education is faced with major challenges: increased numbers entering the system; changes in student demographics; and ubiquitous access to mobile and cloud-based technologies. Changing patterns of work also bring new demands and a much greater emphasis on lifelong learning and ongoing training. Much of what is needed is higher-order knowledge, which can only be acquired through higher education. In the face of these major challenges, we have an opportunity to transform education, to widen participation to include those previously excluded, to harness higher education to assure we have the necessary workforce to successfully address changing demands in knowledge-based economies. In the face of these challenges, new forms of flexible and blended learning entry, such as MOOCS in higher education, demand that we pay close attention to the quality of the education provided, whether it is delivered purely face-to-face, solely online or through a mix of the two modes. This presentation examines a framework for assuring a quality education, no matter what the mode of delivery.